The time to take measures for a ship's safety is while still able to do so. Nothing is more dangerous than for a seaman to be grudging in taking precautions, lest they turn out to have been unnecessary. Safety at sea, for a thousand years, has depended on exactly the opposite philosophy. We now have 138 files in the database. In statistical parlance this might be an acceptable sample size were it not for the fact that it is divided up between 61 monohulls, 61 multihulls, 9 power vessels and even 2 rowing boat using a wide variety of drag devices. In essence the database is still young and we need many more files before each sample size is large enough to allow us to access a specific type of sailboat and pass a reliable judgment on its behavior in storms. Nevertheless we are off to a good start. For one thing we now have crucial insights that apply to seamanship regardless of type of vessel or drag device being used; we have a clear dichotomy between sea anchors and drogues; we see the emergence of certain patterns; we can at least venture educated guesses about the behavior of classes of vessels. But perhaps we should concentrate on what we do have in the DDDB, rather than engage in guesswork and idle speculation. A bird in hand is worth ten in the bush. A memorable scene from the Ron Howard film Apollo 13 comes to mind. Apollo 13 is half way to the moon. It is moments after the explosion. Jim Lovell has uttered the famous words, "Houston, we have a problem." Odyssey, the damaged service module, is venting precious oxygen into space. The fuel cells are dying, master alarms are blaring, the instruments are malfunctioning and the full extent of the damage is unknown. The astronauts have lost attitude control and are in danger of drifting away into space. Pandemonium has broken loose on the spacecraft and in mission control. This is the scene in which we find the cool, calm and collected flight director, Gene Kranz, ordering everyone to quiet down, lighting up a cigarette and making the following statement: "Let's review our status... what do we have on the spacecraft that's good?" Essentially this is the same sort of question we are now asking. Having gone through hell and high water - gales, cyclones, hurricanes and the Queen's Birthday Storm - we need to quiet down, review our status, and ask, "What do we have in the DDDB that's good?" The insufficiency of the individual sample sizes notwithstanding, all of our case histories have one thing in common: heavy weather. Not simulations, not tank tests, not abstract computer models, but real life heavy weather scenarios. Since these files do deal with the real world we should perhaps seize the opportunity to look for crucial insights that can be applied to seamanship, irrespective of type of vessel. I've been hove-to in cyclones, I've run before, I've used trysails, I've dragged things, I've been beam on, you name it, on every sort of vessel. To me the biggest thing is that you must be prepared. I think that a lot of people get into problems because sometimes these weather patterns creep up on you and then suddenly it really is very nasty and you haven't quite realized it, and then to get out the necessary drag device, whatever it may be, is almost too late. By then people are seasick if it's a cruising boat, or they're not too used to it, or not necessarily experienced. So to have something easy to put over, such as a Seabrake, or whatever drag device you are using, I think that is very important. We learned that given a shorthanded crew, the rig you go into extreme weather with is most likely what you will be forced to stay with for the duration. Setting aside our experience of the event and looking at this from a seamanship point of view, we would offer the following. Make up your mind before you get in a situation of this type as to what you are going to do. Once you commit to a tactic it is almost impossible to change tactics.... It was all you could do to just hang on, let alone shackle and deploy a drag device. Never expected it to get this bad or I would have used the parachute anchor. It was in the lazarette and my rope was still shackled to the anchor chain and anchor, all lashed forward. There wasn't a snowball's chance in hell that I was going forward in those winds and seas to unlash it, undo the shackle, etc.... I can't believe anyone would go forward in storm conditions to work anything on the foredeck. There was absolutely no possibility in our weather conditions of being able to go forward each hour to check for chafe... it was impossible to go forward again as far as the bow during the rest of the 53 hours at anchor before our rescue. The conditions were so bad that it was impossible to be anywhere on deck. We used a harness just to visit the cockpit - almost all of our time we spent below deck. Rain came horizontally so hard as to sting the face. Motion aboard the cat was so irregular. Any movement but hanging on was a chore. So the classic rule is "heave-to as soon as you think about it." A falling barometer, wind clouds, and a tired crew will confirm your decision to heave-to early. Be prudent; the longer you wait to round up into those overhanging waves, the more fearsome and dangerous it will become. Can we agree that irrespective of type of vessel, or type of drag device, or strategy or tactic, readiness and preparation are two of the most important considerations here? It doesn't make much sense to theorize, speculate and invest sums of money in sea anchors and drogues, only to find out too late that one dare not venture on deck to deploy anything. Common sense alone would seem to dictate that offshore one should always be ready and prepared, just in case. But looking through the DDDB we see all too many examples of the opposite - a pattern of failure rooted in the human vice of inertia. Perhaps we are catching a glimpse of the biggest problem of them all. We see all too many sailors running into heavy weather unprepared, and then having a devil of a time trying to put everything together at the last minute. When I went up onto the foredeck, it was found that the deck-light was not functioning, so I had only the fitful light of a flashlight shone from the cockpit towards me. First of all I launched the pickup buoy and line, followed by the float buoy, but these were torn from my hands by the wind (nearly 40 knots) and by waves sweeping over the deck and over me. I then realized that the genoa furling line made things complicated and that I ought to have launched all this gear beneath the furling line instead of above it, so I pulled it in and tried to stuff it back into the sea under the line instead of over. Trying to do this caused a tremendous snarl-up, so I was forced into spending a long time lying sprawled on the deck in the almost continuous dark, with waves washing over me, trying to sort it all out. This time I was better prepared. I had disconnected my anchor from my 5/8" nylon rope and pulled it all on deck. I tied the bitter end to the samson post, leaving about 10 feet for freshening the nip. I had already run the rope through a fairlead on the bottom of the Cranse Iron (this is how I anchor anyway) and led the rest aft to the cockpit. Where the rope led through the fairlead I had sewn on a meter of leather for chafe. This was set so the leather just passed through the fairlead so I could let rope out to "freshen the nip" if necessary. (Later I never checked for chafe because I was too frightened to go forward). I deployed the parachute early while I was hove-to. From the cockpit I deployed the float (enough buoyancy to float the chain and anchor on 20 feet of rope attached to the center of the crown of the parachute) over the windward side. This was followed by the parachute anchor, chain and rope. The boat was making slow leeway so I was able to maintain complete control of the rope until all (300' + 20' chain) was out. As I let go of the rope it broke the thread along the life line until the boat was riding bow to the wind and seas. I dropped all sails and went below. The U.S. Pacific Fleet was caught unprepared in a typhoon in World War II and suffered horrendous weather-related losses. The incident moved Admiral Chester W. Nimitz to make sweeping policy overhauls that are now observed on all US naval ships in periods of heavy weather. The embarrassment also prompted the admiral to make that famous statement of his about nothing being more dangerous than for a seaman to be grudging in taking precautions, "lest they turn out to have been unnecessary." Read the opening quotation at the beginning of this section each time before you put out to sea. It pays to be ready, awake and prepared, even though you may never run into heavy weather. Whatever your boat may be, and whatever strategy you decide is right for it, devise a method of implementing it in adverse conditions. Attend to all the details ahead of time, before you put out to sea. By the time the storm actually hits you may be tired, disoriented, seasick etc., and it may be too late to think about such things, let alone go out on deck and experiment. With so many advantages and no serious disadvantages, the decision to deploy a sea-anchor becomes almost a non-decision: go ahead and do it. If you are tired and the weather is sloppy, ride to the sea anchor and get some rest. If the weather worsens you are all set to ride it out comfortably; if it improves you can start sailing again after a decent meal and a good night's sleep. As your mother said, that never hurt anyone. In the conditions we were caught in, we believe having our para-anchor set up, ready for deployment prior to leaving port, was crucial in the safe and easy deployment.... The anchor rode was fixed to a strong point at our bow, led aft and held in position by plastic cable ties at 6-inch intervals along the port side toerail to a deployment bag containing 125 meters of 18mm 3-strand nylon anchor rode. This was set up prior to our departure from Adelaide to cross the Great Australian Bight. Deployment simply involved reaching from the safety of the cockpit to the rode deployment bag, unlacing the top - removing the end of the rode and shackling it to the parachute anchor. Trip line floats were then fed overboard, followed by para-anchor in deployment bag. I just undid the straps and the Rode Bag toggles and tossed it overboard - it all sorted itself out and within five minutes we were riding head to wind. I am totally sold on the concept! We had been pooped twice before we hove-to and the seas increased in ferocity somewhat later. Manufacturers are constantly working on ways of making deployment and retrieval easier. Para-Tech sea anchors now come in a DSB (deployable stowage bag), for example. Look for easy deployment - cylindrical - rode bags to begin showing up on the market as well. One simply packs the rope inside, throws the heavy bag into the sea and long lengths of rope come out of the top of the bag. Victor Shane tries to avoid the bags that have full length zippers as he has seen a few cases of the rope coming out of these in clumps. Bag or no bag, one should never throw everything into the sea carelessly. Looking through the DDDB we find all too many cases of the float line fouling the parachute during deployment. The float line is generally considered a necessity, though some sailors - including the Pardeys - opt to take it off altogether. It is the 30-40' of line and float that keep the parachute from sinking should the wind die down (refer to the retrieval diagrams here). One should always try to keep this short float line (and/or trip-line) away from the parachute in the initial stages of deployment. Either heave the float well clear before putting the para-anchor into the water, or hang on to the float and let the para-anchor pull it into the water along with the rode as the boat drifts downwind. It took us about 50 minutes to bring the bundle in, and then the sad story could be seen. What had happened was that the tripping line had twisted round and round itself until it was as stiff and unwielding as a metal spring and that this metal-like mass had ensnared with it some of the shroud lines of the para-anchor. Perhaps it would make more sense to use flat, rectangular floats that don't spin as easily. Or one could easily ballast a round float by tying on a few fishing weights. Or one could perhaps devise a flagged, ballasted man-over-board pole type arrangement. At any rate, whatever float you use make certain there is a small, freely rotating stainless steel or bronze swivel between it and the line it is attached to. Make certain this swivel doesn't get fouled or somehow restricted during deployment. If you opt for a full trip line make certain it is fairly taut or it will hang down and foul the parachute and rode. Make doubly sure there is a small stainless steel swivel next to the float and tie it on properly. The simplest way would be to use a large fender for the float - a fender with eyes on each end. Tie the small swivel of the float line to one eye of the fender; tie the full trip line to the other eye. The para-anchor worked well and I was most impressed till it fouled.... The trip line fouled the chute and with the chute partially collapsed we lay a-hull.... Next time I won't use a trip line. I could have got the chute back in with the electric capstan in the calm after the storm. We were extremely fatigued and totally disoriented. With no horizon and our brains not functioning too well, (extreme fatigue does funny things to the mind) we decided to deploy the sea anchor and wait until daylight before doing anything else. We deployed the sea anchor in text book fashion. We have the DSB (deployable storage bag). Nothing fouled up, it was almost too easy. The boat slowly drifted downwind and when the rode ran out she swung straight into the wind. At that point we just rode the waves. We lashed sails down and made sure everything was secured and that was all there was to it. In File S/M40 we find the 45' monohull Celtic tethered to a para-anchor in the Gulf of Alaska for five days without any problems. The Casanovas (File S/T-1) never ran into the problem in eighteen years of cruising, even though they always used full trip lines. There are numerous other success stories, all of which inspire us to believe that fouling problems can be avoided through preparation, organization and early deployment. To believe otherwise is to concede the game to Murphy. From improperly set spinnakers to Danforth anchors carelessly thrown into the water, anything and everything can foul at sea if allowed to. "Chafe is the great enemy of all drag devices." As we worried about chafe, the para-anchor was working beautifully. The boat rode up the face of the waves punching through their tops as the huge seas rolled under us. No more green water came on board, no more near knockdowns. For four hours we rested below, taking turns watching and letting out the rode to combat chafe. But in spite of our efforts the line parted after an especially strong gust, and the sea anchor was gone. Main concern: chafe was definitely a problem. Before I leave on my next trip, I'm going to put a couple of feet of chain into every hundred feet [of tether] so chafe will be a non-issue. The primary anchor had not been stowed before going offshore, so the bow roller was not available for use, and the anchor caused chafing... the rode was chafing on the bow roller next to the anchor due to the movement of the boat.... Attempts to re-route the rode resulted in the rode and the sea anchor being lost. Unfortunately the outer covering [of the double braid] chafed, so I pulled enough rode in to put sound line on the cleats. Overnight the rode had chafed through the teak cap rail below the chock in an arc, cutting downward 3/4" to 1" into the wood. And the chafe was the problem. Because of the distance from the winch to the chock being so great, it created a longer spring and chafe [area] on the line. And sometime during the course of the day, this line chafed in two. Barometer dropped from 1018 to 1002 in 3 hours! Wind started one hour later and built to Force 10 where it stayed, never dropping below Force 9 in 48 hours.... Bridle (3/4" nylon) chafed completely through and had to be replaced with 5/8" backup bridle. I found the bridle dangling over the transom, severed on both sides. The 3/4" nylon bridle had been abraded by the self-steering mounting brackets. There was damage to the stern pulpit and deck fittings, evidence of the forces and motion exerted on the hull by the [series] drogue before it parted the bridle. To counter chafe at the weight end [of the series drogue] we enclose the chain-to-rope splice in a spiral whipping so it cannot move. At the bridle end we enclose the lines in thick-walled polyethylene tube where they pass over the transom. Every two hours or so a foot or two of rode saved on deck for the purpose was released to even out any chafe. No chafe or even black marks from the inside surface of the fire hose was ever noted. We had 50' bridle arms that went through a specially made SS bow plate.... The bridle was encased in 1/4" thick rubber tubing where it hit metal on the plate. There was absolutely no possibility in our weather conditions of being able to go forward each hour to check for chafe, also the force of the water on the anchor line made the line like a steel rod, and one could never have got any slack to be able to replace a chafe guard. Realizing this from the start, Robin attached a ten foot length of half-inch section anchor chain to the eye of the line, which ran through the starboard bow roller. This took care of the chafe, as it was impossible to go forward again as far as the bow during the rest of the 53 hours at anchor before our rescue. Due to the setup of 1 meter of chain at the bow we had no chafing. Before I leave on my next trip, I'm going to put a couple of feet of chain into every hundred feet [of tether] so chafe will be a non-issue. At one point the anchor chain jumped out of the stainless steel roller (we forgot to put pin through top of roller) and found its way down the starboard side and into the stainless steel chock causing only cosmetic damage. Due to the rugged nature of our chocks, we would intentionally place the chain in the chock in the future. CAUTION: The drawback with chain is that one may not be able to cut it away. In an extreme situation (large container ship on a collision course, for example), one can cut a nylon tether with a knife and get out of the way. One should always be able to cast chain off as well. Go down below and take a look inside the chain locker of any ocean going yacht. If the bitter end of the chain is secured to the hull by the sort of lashing shown on page 111 of Earl Hinz's Complete Book of Anchoring and Mooring (Cornell Maritime Press, 1968), you will know that you are dealing with a real seaman. If it is attached to the hull by means of a rusted out, frozen - fifteen year old - shackle, you will know otherwise. Properly used, chain will eliminate chafe and provide for purely mechanical - catenary - shock absorption. But make certain that in an extreme situation you can throw it off and free the boat of the sea anchor system. If you foresee ending up in some such extreme situation (shipping lanes, strong ocean currents, etc.) you must rig up a full trip-line. Multihulls can say sayonara to the chafe demon by shackling the bridles to the bows, like the Casanovas did (File S/T-1). At 01:30 Sue, braving the black night, high seas, 35 knots of wind (and no trampoline), checked the bridle [leading directly off cleats, no chocks] for chafe - nothing! Similarly at dawn - no chafe. After lying at anchor for 40 hours, we were surprised to find no signs of chafe. One of the nice things about the Edel Cat is that the cleats are on top of a rounded deck with NO CHOCKS. The bridle lines went directly from the cleats to the parachute touching only the smooth deck or forward aluminum cross beam at extreme angles, hence hardly any chafe at all. Many multihull sailors preferred to lead the bridles through snatchblocks and bring them back to cockpit winches. Because the bridle lines are bent around rotating blocks (instead of stationary chocks), Murphy's little goblin has a lot less to get his teeth into. And because the bridle arms can be adjusted from the relative safety of a multihull cockpit, one can "freshen the nip" easily. When purchasing snatchblocks choose the largest sheave diameter you can afford. The larger the diameter of the sheave around which the line turns, the lower the stress on the rope at that point. I have replaced the sea anchor with another.... The tether is 5/8" nylon, 500 feet long. There is an oversized stainless steel swivel. The bridle arms are longer now, made of 3/4" Dacron, which is less stretchy than nylon and hopefully better resistant to abrasion. The geometry of the attachment of the bridle to the boat is now different. I believe that it is significantly better. The two legs of the bridle now come through the points on the bows of the amas where the stainless steel plate holding the snatchblock is much more substantial than what was there before. The snatchblocks are considerably more substantial than the ones they are replacing. The bridle is led straight back onto the deck of the ama and tied off to a cleat which is through-bolted to the main deck, and underneath is attached and through-bolted to an L-shaped steel backing plate, in turn through bolted to the main crossbeam. We've realized the attachment point on bow needs to be extremely strong. Parachute anchor was shackled to 1/2 inch chain link welded to ship's anchor. Our ship's anchor was stored below deck level via custom bow fitting, then secured aft by 3/8 inch Ronstan rigging screws, secured to a 10mm stainless steel plate, bolted under the anchor winch. Winch and plate fastened by 6 x 3/8 inch stainless steel studs. Both the fixing point to the ship's anchor and to the plate were backed up by secondary systems. Ronstan rigging screw had 10mm chain back-up. Fixing to anchor was backed up by 5/8 inch stainless steel bolt, through anchor cheeks. Both systems failed! Ronstan rigging screw had 8 turns of thread removed. Back-up held, but ship's anchor smashed around, causing damage to our stainless steel bow fitting. Chain-link welded to ship's anchor was torn off and secondary chain from nylon rode took up the weight on 5/8 inch stainless steel bolt through anchor cheeks. If you are going to pay a metal shop to make up custom stainless steel deck plates, padeyes, fittings, etc., specify large stock and have them increase all the dimensions three or four times. Most metal shops charge by the hour anyway and you will end up paying the same sort of money for a skimpy deckplate as you would for a big, substantial one. Take a good look at some of the no-nonsense fittings on a Coast Guard cutter or a Navy patrol boat. The ones on your boat should be somewhat similar, large and oversize, with many drill holes for attachment and backing. Most of the petite items found in marine stores don't fit the bill. Have specialty fittings custom-made for your boat. Once made and installed these will pay handsome dividends in peace of mind in any anchoring situation. When your boat is bucking to a Danforth in forty-knot winds, fifty feet from rusty pilings in some godforsaken corner of the world, you will thank yourself. Besides, when fellow cruisers see those custom-made no nonsense bow fittings they will realize that they are dealing with a real seaman. Since rope failure can occur regardless of vessel type, the DDDB's overall sample size allows some useful analysis. That there are very few incidents of rope failure in the 138 files is significant, to say the least. While loss of gear due to line chafe is all too common, we find only three cases of rope failure - overloaded rope snapping outright. Two of these were caused by the rode length being far too short. The third case involved a large, heavy commercial fishing vessel using ridiculously small diameter rope. This resulted in about 150 feet between the sea anchor and the bow.... This was not enough line to absorb the energy.... At about 1000 hrs. a large wave broke over most of the vessel... and then broke the 5/8" line (breaking strength 14,400 lbs.) I determined that the line had broken rather than chafed through by observing that the ends of the strands were all about the same length and were slightly fused. In File S/C-6B we find Ariel, a 43' x 25' x 15,000 lb. Crowther catamaran running into a horrendous storm on the way back from Hawaii. One leg of the 5/8" bridle arm snapped outright when a wave broke against the boat. Ariel's tether was 250' x 3/4" nylon three strand. It should have been at least 400', preferably 500'. It would then have stretched and absorbed the shock that 250' of line obviously couldn't. In File S/P-7 we find the 50' x 70,000 lb. commercial F/V Kella Lee using a 28-ft. diameter parachute sea anchor along with 500 feet of 1/2" (half inch!) nylon braid with a breaking strength of about 8,000 lbs., for station keeping applications. This seems to have gone on for about two years! The line finally parted in heavy weather, the failure occurring right at the thimble itself. Way back when Victor Shane first initiated the Drag Device Data Base he was sure it would be filled with numerous cases of rope failure. It hasn't turned out that way. Perhaps one can infer something useful from this. Three cases out of 138 heavy weather files boils down to 2.3% - an extraordinary indication if reliable. This would seem to be telling us that if the tether is properly sized, long enough and in fairly good condition, one can stop worrying about it breaking and start worrying about more critical things - such as chafe. Determining correct rope diameter for sea anchor applications has never been easy, however. Most safety experts try to dodge the issue, and with good reason. Rope diameter has to be small enough to allow adequate stretch and shock absorption. At the same time it has to be large enough not to break. We are still a long way from reconciling these contradictory requirements in a simple formula. Since there are so few cases of rope failure in the DDDB, it would at least appear that most of the tethers were more or less properly sized, everything else being equal. One will have to wait a few years, however, to see if the percentage holds out. There should only be about 20 cases of rope failure when there are 1000 files in the DDDB. Should this be the case one might then be able to nail down the "bounding box" - the size above and below which something never or always happens for a given displacement. A crude exercise: In File S/P-7 we find rope failing when a 70,000 lb. commercial F/V tried to use 500' x 1/2" line with a breaking strength of about 8,000 lbs. - 11% of the displacement. Not enough strength, everything else being equal? In File S/C-6B we find rope failing when a 15,000 lb. Crowther catamaran tried to use 250' x 3/4" rope with a breaking strength of about 15,000 lbs. - 100% of the displacement. Not enough stretch, everything else being equal? In File S/M-32 we find rope failing when a 10,000 lb. Hunter tried to use 150' x 5/8" line with a breaking strength of about 14,000 lbs. - 140% of the displacement. Not enough stretch, everything else being equal? In File S/C-3, on the other hand, we find a 12,000 lb. Prout catamaran using 300' x 3/8" nylon three strand tether with a breaking strength of about 4,400 lbs. - 37% of the displacement - and the rope did not fail. Does this mean that the line had the right combination of stretch vs strength, everything else being equal? It will take many more files and some rigorous scientific analysis to answer this question. We have two cases of rig loss due to the failure of knots in the DDDB. In File S/M-39 we find a sailor deploying a sea anchor on 2 x 200-ft. lengths of rope, knotted together with bowlines. The entire sea anchor rig was lost when the rope failed at one of the knots. My mistake was to attach the bridle to the 400' tether using a bowline instead of a proper splice & thimble, and that's where the line eventually chafed through. If you get caught unprepared and have to tie lengths of rope together use the correct knots - the kind that tighten up on the purchase and don't invite chafe. Simple bowlines won't do sometimes. Use double sheet bends when attaching two lengths of rope together or, even better, use a carrick bend or double fisherman's (see this climbing site - climbers are pretty careful about the knots they use!) ; use fishermen's bends (also known as anchor bends) when tying lines onto rings, mooring bits, shackles etc. Always mouse the ends so the knots can't unravel. At the very least you can put on a "poor man's mouse" by means of electrical or duct tape ( Victor Shane likes to use two large, stainless steel diaper pins, available at drug stores). We still stressed a bit on the perfectly reasonable assumption that our cocktail of lines & chain, and our cat's cradle of knots (double sheetbends) would certainly part. But no... the worst that happened from then on was a sharp jerk as the bows were yanked down as we came up over a big steep one. Here is a principle derived from Newton's laws: The longer the stopping distance of an object in motion, the less the force required to stop it. This principle is incorporated into all sorts of human creations by architects, mechanical and aeronautical engineers, bridge constructors, crane operators, theme park designers, skydivers, bungee jumpers, etc. Even crash dummies are familiar with it. Where automobile airbags are concerned, a controlled stopping distance of only twenty inches (as opposed to a non-controlled distance of zero inches) can make the difference between life and death in a head-on crash. This resulted in about 150 feet between the sea anchor and the bow. This was not enough line to absorb the energy.... At about 1000 hrs. a large wave broke over most of the vessel.... The bow cleats are welded to a 1/4" stainless plate that is in turn bolted through the sides of the vessel. The strain curled this plate through more than 90 degrees, crushed the pipe forming the legs of the cleat, and then broke the 5/8" line (breaking strength 14,400 lbs.).... The strain also curled the main plate holding the forestay. Loss of this plate would have meant loss of the mast. The structure of the boat was also damaged, opening the joint between the hull and deck on the port side, and we started to take water in through the gap. Later one leg of the 5/8" bridle SNAPPED in the center when hit with very large wave, throwing Ariel backward, shearing the foam & fiberglass off of one rudder completely, and leaving only half of the other rudder (which later broke off). Crew eventually added 100-150' of anchor chain to the 250' of 3/4" nylon tether and rode out the rest of the storm.... Moral of the story: USE LOTS OF PRIMARY TETHER! What is adequate for Force 9 is not adequate for Force 10! Compelling evidence in two back-to-back files: In File S/P-1 we find the 50' x 22-ton commercial F/V, Sea Roamer, tethered to a 28-ft. diameter C-9 parachute in Force 10 conditions by 150 feet of 3/4" Poly-Dacron rode. The rode was neither long enough, nor did it have sufficient elasticity to absorb the dynamic loads imposed by the wind and the seas. Those loads ended up being transmitted directly to the boat and the parachute, turning the latter into ribbons. In the next file (S/P-2) we find a larger, much heavier (65' x 43-ton) commercial F/V, Holly & Michael, tethered to the exact same type of parachute (28-ft. diameter surplus C-9) in Force 9-10 conditions for 24 hours, without incident. The difference? This boat was using 450 FEET OF NYLON rode. At that point we deployed the para-anchor. This device was utilized to stabilize an emergency situation and was deployed to ride out some bad weather. Because of the immediacy created out of the breakage we had to deploy it as fast as we could and with what line we had immediately available. For this reason the first line tied to the para-anchor was a 1/2" pre-stretched Dacron backup spinnaker halyard.... This immediately proved to be a mistake. The shock load transmitted back through the line was unbelievable. We had deployed the whole 500 feet of line, which probably was not enough in those conditions, but once deployed, it was too dangerous to consider adding further line (of which we actually had another 800 feet). The entire 600 ft. of rode payed out under control from purchase turns around the windlass drum and snubbing horns.... 600 ft. was adequate for those conditions. It served very well, though I could have wished for more in the locker, had the seas been higher, or more frequently breaking. Aside from small deck fittings pulling out and a few bow rollers getting bent out of shape we don't find too many cases of union hardware failure - the hardware used to join sea anchor, tether, bridle and chain in the water. We must be doing something right as there are no cases of shackle failure in the DDDB. The two cases where hardware did actually fail involve galvanized swivels. After recovering the remains of the bridle we saw we had lost the two shackles and the swivel. The remains of the arms of the bridle were unraveled and twisted around each other - everything else was lost. SEA ANCHOR. For yachts to 70 feet LOA and less, a sea anchor of a diameter at least equal to 35% of LOA with a tether that can be made up of stout nylon line equal to ten times LOA, with thimbles, shackles, and swivels at each end of tether. For multihulls, a bridle is recommended that is 2.5 times the BOA [beam over all]. A sea anchor trip line is optional. Back in December 1997 some of the wording in the above paragraph underwent rigorous debate in Compuserve's Sailing Forum. Participants included Captain John Bonds, executive director of US SAILING, Bill Doelger, chairman of the multihull council of US SAILING, Earl R. Hinz, as well as Victor Shane and a number of other sailors from around the world. Some sailors objected to the ambiguity contained in the words "stout nylon line," for example. Others objected to relating sea anchor diameter to LOA (length over all), but could offer no alternative formula with practical applications. Others yet objected to relating tether length to LOA, justifiably arguing that it should relate to wave heights, as Shewmon recommends. But again, when pressed for practical ways as to how the average sailor might carry enough line on board, or go out on deck in a storm, measure the wave heights and keep adjusting the rode length accordingly, there was little forthcoming. Because of the strong correlation between vessel length and everything else (displacement, draft, beam), Victor Shane argued that there is good reason to base sea anchor diameter on a percentage of the LOA, "35% of LOA" being a practical, easy-to-apply formula. Earl Hinz argued that this should be a "minimum," in so far as flat circular, zero-porosity parachutes are concerned. Thus a 30-ft. yacht would need a para-anchor with a minimum diameter of 10.5 ft., a 40-ft. yacht would need a para-anchor with a minimum diameter of 14 ft., etc. The debate raged on for several weeks. In the end, and with practicality in mind - avoiding unnecessary complications, while insuring that every boat was equipped with the minimum needed - the paragraph emerged for the most part in tact, with a few words amended. (Copies of the booklet are available from US SAILING, P.O.Box 1260, Portsmouth, RI 02871-6015, USA). Under cyclic loading, drogues and small parachutes can collapse and start to tumble so that they either cause themselves structural damage or tangle so badly as to be rendered ineffective. Large parachutes can avoid collapse by virtue of their higher drag causing the tow line to stretch rather than to pull the parachute through the water. There is now significant correlation between this aspect of the Wolfson test results and the full scale real life experiences contained in the DDDB. The correlation, as such, covers the entire gamut of vessels and sea states. In general, the boats that used larger diameter para-anchors fared better than those who tried to use smaller devices. The problem files - where the sea anchor failed to do an adequate job of pulling the bow/s into the seas - involved smaller diameters. For yachts under 70 feet LOA, the "bounding box" relating to sea anchor diameter seems to start somewhere around 12 feet and end somewhere around 28 feet. Few problems were encountered when sea anchor diameter was 12 ft. and greater; it does not appear that there might be any advantage in using a sea anchor larger than 28 feet in diameter. Possible exceptions to this generality would be smaller Shewmon sea anchors, provided their design will in fact allow them to remain well below surface activity throughout storms, and also smaller BUORD-type parachutes used in conjunction with the "Pardey bridle," provided the turbulent field or "slick" set up by the vessel in question will be potent enough to smooth down the waves to the point where they can no longer tumble sea anchors. These exceptions notwithstanding, Victor Shane increasingly leaned towards 12 feet as the cut-off point for minimal diameter. The reasons for this opinion were again put to the test in the Compuserve debate. Part of Shane's argument centered around parachute industry standards as they relate to nominal versus inflated diameters. Para-anchors manufactured in the US, in Australia and in New Zealand all use US parachute industry standards - they go by the nominal diameter. This means that a 12-ft. diameter para-anchor (a circular parachute with a nominal diameter of 12-ft. when laid flat on the ground) will have an inflated diameter of about 8 feet in the water (.65 to .70 of the nominal for flat circular fabrications, according to US parachute industry standards). This places the center of the canopy only 4 feet below surface action. Imagine this parachute on the crest of a 30 ft. breaking wave and you can see how precarious its footing might be. In light of the above, one might say that most attempts at determining sea anchor diameter on the basis of vessel size, or vessel displacement, or vessel beam, or vessel draft are flawed. It makes much more sense to go with a large diameter regardless, because a big parachute stands a far better chance of staying put and not getting tumbled by surface waves. The Pardey strategy notwithstanding, the interaction between a para-anchor and wave formations has little to do with the size, weight, width or draft of the vessel in question. Or as Earl Hinz put it, "Neptune cares not a whit about whose craft is riding out his storm." A large diameter para-anchor cannot be pulled through the water so easily and is far less susceptible to the problems relating to sea anchor stability. Its basic shape may get partially distorted by the passage of an unstable wave, but if the canopy is big enough some part of it will "grab" and provide enough drag to keep the yacht aligned and under restraint. Call it the shotgun approach if you like, but there's not much sense in relying on a sea anchor that is itself being thrown by the waves. In the daylight we could see that the waves were not less than the height of our spreaders (about 25') and about 150-175' from crest to crest.... We could look behind and watch the drogue start up a wave as we came over a crest. We could see it tumble on its own crest as we slid down the back side of ours. About the time we were in the trough it would grab again, and up and over the next crest we would go. We could clearly see the yellow cone tumbling repeatedly. It would get rolled, get tossed around, go end over end and everything in between. In File D/T-2 we find the 31-ft. trimaran Galliard using a 5-ft. diameter sea anchor off the stern in Force 9-10 conditions. At one point it collapsed and had to be reeled in for a sorting out. The sea anchor was getting rolled by the steep, confused waves, from the left, then from the right. Later, as I was watching, it got caught by two cross-seas and collapsed right before my eyes. It was like the water was boiling... it didn't have a pattern to the swell. It just hit us from all sides.... The force of the water on the anchor line made the line like a steel rod, and one could never have got any slack to be able to replace a chafe guard. Finally, a breaking wave caught the drogue and tangled it around itself. We left it deployed, but effectively lay a-hull all night and into the next day. Took several breaking waves over the boat - not recommended! Granted, some of these problem cases involve sea anchors being used off the stern. Yes, this does complicate the overall analysis - these vessels may have been bungee jumping. The files do nevertheless make us aware of the stability limitations of smaller para-anchors. In File S/T-19 we are stunned into silence by the possibility that a 24-ft. diameter Para-Tech sea anchor (the biggest one Para-Tech makes for small craft) might have been picked up and thrown by a great rogue wave coming in at an angle. Whether this was in fact the case, or whether it was just the 55-ft. trimaran herself being picked up and thrown sideways on the surface of the sea is not known - turn to the diagram in the middle of File S/T-19 and try to guess for yourself. The fact is that the line went temporarily slack, allowing the yacht to fall out of alignment and come beam to the seas. Although we have no way of knowing exactly what may have happened, whether the big parachute actually lost its footing, and if so, whether it was in the process of momentarily recovering and restoring system tension, the incident does provide food for thought - some of the stacking waves in the Queen's Birthday Storm were reputed to be 80 feet high. All of which drives home the point about erring on the large side when selecting a sea anchor diameter. Although Tortuga Too survived this mammoth wave crashing on her deck, there was no backing down on her rudder, nor any structural damage to the hulls. In file S/C-5 we find the 50-ft. catamaran Sebago attempting to use a 4-ft. diameter sea anchor off the bow in Force 9 without much success. The cat would drag it round until she was almost lying a-hull. When she was momentarily head-to the seas Sebago would likely have been drifting down on her rudders as well. In sharp contrast, in file S/C-6 we find the 43-ft. catamaran Ariel using an 18-ft. diameter para-anchor in Force 9 conditions without any problems. The bows remained adequately snubbed into the seas and there were no undue strains on the rudders. The sea anchor was deployed from the bows, but allowed too much leeward drift (estimated 2-3 knots), and also allowed us to fall back off the steep, short seas, which had built up in the southerly current. I think that falling back off a larger 15 ft. wave at an angle, we broke both tillers. Note that a catamaran with two large transom-hung rudders, when backing into a trough and burying the sterns, exposes two blades, and two sets of cheeks to the force of the water, approximately 4 times the area of a typical trimaran spade rudder. It is therefore essential that this type of boat (like a Wharram) make no sternway, else use the sea anchor off the stern.... We now have a 24' diameter parachute for use off the bow. In contrast, in File S/C-3 we find the 37-ft. catamaran Rhayader using a 12-ft. diameter - zero-porosity - Para-Tech sea anchor in Force 9 without complaint. The twin bows stayed adequately snubbed into the seas and there were no undue strains on the rudders and steering assembly. When modern, purpose-made sea anchors first surfaced there was a concern about rudder vulnerability. It was thought that sea-anchored boats would "drift-down" in storms and break off their rudders. It hasn't turned out that way. Going by accurate drift figures obtained from GPS readings there really isn't much "drifting down" to speak of. It turns out that being tethered to a big parachute is much like being anchored to a Danforth. Not that rudders aren't vulnerable in storms. Assuredly they are, as is everything else. A moving part like a rudder is vulnerable in a storm regardless of whether the vessel is anchored to the seabed, or anchored to the sea's surface, or lying a-hull, or hove-to, or running off. Remember, rudder breakage was a common problem among the yachts that elected to run off during Fastnet '79, several rudders in fact "exploding" outright - see second plate in the photographs appearing after page 232 of Fastnet Force 10 by John Rousmaniere. There are a few cases of rudder and/or rudder fitting failure among the sea anchor files. We find most of these clustered among the multihull files, perhaps indicating a weakness in rudder construction, especially where the "home-built" multihulls are concerned, rather than a systemic flaw relating to the strategy of sea anchoring. In File S/T-19, for example, we find the 55-ft. Piver trimaran, Surrender, being possibly picked up and thrown sideways by a great rogue wave. The 2-inch bronze rudder shaft snapped below the quadrant, the owner reporting that it "appeared to have twisted like a piece of plastic almost 90 degrees before breaking." A heavier - stainless steel - rudder shaft might have been called for here. At any rate, the rudder didn't break off where the shaft enters the hull. A moot point because if this boat been lying a-hull without a sea anchor she may very well have been capsized by the rogue wave. Had she been running off, she may very well have been pitchpoled. So the breakage of the shaft below the quadrant and the temporary loss of steering would seem to be more than offset by the fact that the boat remained upright and was sailed thousands of miles back home. Fortunately I had numerous tools on board, as well as a good assortment of fasteners, and by cutting up some of the floor boards, and after hours and hours of jury rigging, we were able to effect a workable repair of the steering quadrant. Later one leg of the 5/8" bridle SNAPPED in the center when hit with very large wave, throwing Ariel backward, shearing the foam & fiberglass off of one rudder completely, and leaving only half of the other rudder (which later broke off). The rudder was lashed to center at the quadrant, which broke twice - 6mm pre-stretched cord broke first, then 16mm nylon braid also didn't hold. We managed to make it hold on 18mm nylon anchor rode. Small twist, 10-15° in 2-inch 316 stainless steel rudder shaft at the point where quadrant is fixed. When asked whether the para-anchor saved the boat Deborah Schutz answered without hesitation: "Absolutely!!!" Rudders are replaceable. Lives are not. Besides, looking at the DDDB from a statistician's dispassionate point of view, rudder failure does not appear to be a problem pattern where sea anchors are sufficiently large and where the rudders themselves - stock, shaft, post, quadrant, fittings, cables, etc. - are of adequate design and construction. And it goes without saying that they had better be, otherwise they may fall apart in the course of ordinary passage making, as with Snow Dragon (File S/M-32) and Rose Marie (File S/C-13). Transom-hung and keel-hung rudders should have three connection points - heavy duty ones. Tillers should be tied with heavy shock cord (layered bungee) to absorb some of the stresses. Ditto quadrants on wheel systems - just locking the steering wheel may not be enough. Note that the weak point seems to be where the shaft meets the quadrant. This union must be precisely machined - toothed or keyed - with no slack or play. For long term cruising safety, install rudder stops - or rope - to limit rudder travel, as the Pardeys recommend in Storm Tactics (page 32). Without stops the rudder can fold against the transom and may very well snap off if the boat is driven backwards. When it comes to reducing unwanted drift, the most cursory glance at some of the files will prove eye opening. Most of the figures relating to drift were derived from LORAN and GPS readings and are quite reliable. In file S/M-9 the owner of Bounty Hunter reported that she drifted 11 n.m. in 14 hours (Force 8 conditions). Without her sea anchor (9-ft. BUORD) the Hunter 40 (high freeboard, big mast, fin keel) would have probably drifted at 3 knots broadsides, or a distance of 42 n.m. That's a reduction of 74%, even with the relatively smaller, porous para-anchor. The Pardeys have consistently reported their rate of drift to be about 5/8 knot, using the same para-anchor (BUORD) in conjunction with a storm trysail. In file S/M-6 the owner of the J-30 said: "We made about 0.5-0.7 knots sternway, checked by the Loran. It went to 4-5 knots when it [9-ft. diameter BUORD] twisted shut." This was in Force 11 conditions. In File S/M-16 the 31-ft. Cape George Cutter Halo ran into a southerly gale about 100 miles northwest of San Francisco. Her owner beat into the gale for a while and then decided to deploy a 12-ft. diameter Para-Tech. Halo was sea-anchored for 20 hours, drifting only 6 miles - less than 0.4 knots. In File S/M-22 the Bristol Channel Cutter Xiphias was tethered to a 12-ft. diameter para-anchor in cyclone Tia off the Queensland Coast, drifting about 5 miles in three days, likely in and out of a current. In File S/M-27 the Contessa 26, Mai Miti Vavau was tethered to a 12-ft. diameter Para-Tech in 50-knot winds off the African coast for 24 hours, drifting only 3 miles. In File S/M-31 the Bermudan Sloop Lady Emma Hamilton was tethered to an 18-ft. diameter Para-Tech sea anchor in 40-45 knots near oil platforms in the North Sea, drifting about 7 miles in 23 hours. In File S/M-34 the 55-ft. ketch, ORCA was tethered to a 24-ft. diameter Para-Tech in cyclone Justin for 53 hours near Australia's Great Barrier Reef. "Without the sea anchor, they would have found us on the reef," said Robin Ansell. In File S/M-35 we find Robert Bragan and son repeatedly heaving to the sea anchor to hang on to precious ground with the wind on the nose. In File S/M-38 we find the 46-ft. Tayana Prisana II tethered to an 18-ft. diameter para-anchor for 59 hours in 65-80-knot winds off the western coast of Australia, the wind blowing from the northwest. Without the sea anchor the big, fin-keeled yacht would have likely drifted at 3 knots broadsides - 177 miles, putting her up on the beach. Prisana II's remaining option would have been to turn and run back, losing in a few hours the miles she had suffered days to gain. Drift control is of major concern when it comes to lightweight, high-windage, shallow-draft multihulls. In File S/T-1 Joan Casanova reported, "in all times anchored, only once drifted 15 miles in three days..."
The three days in question were spent tethered to a 28-ft. diameter C-9 en route to the Falklands from Cape Horn, with the anemometer pegged at 100 mph. Without her 28-ft. diameter para-anchor the 39-ft. Horstman Tristar would have probably drifted broadsides 3-4 knots, or a distance of 216-288 miles in 72 hours. That's a reduction of 93-95 percent in unwanted drift. In file S/T-6 the trimaran Goodspeed, waiting for daylight to enter the harbor of Beaufort, North Carolina, drifted about 3 miles during 10 hours at para-anchor (12-ft. diameter) in 20-25 knots of wind. Without the sea anchor she would have probably drifted at 2 knots, a distance of 20 miles. That's a reduction of 85 percent in unwanted drift. In File S/T-4 the trimaran Crystal Catfish IV drifted a maximum of 2 miles during 12 hours at para-anchor (18-ft. diameter). Without the sea anchor she would have probably drifted at 3 knots, a distance of about 40 miles in 12 hours. That's a reduction of 94 percent in unwanted drift. In File S/C-2 the catamaran King Kat lay to a 24-ft. parachute from midnight till daybreak outside the rockbound harbor at Flores Island (Azores). Her owner said: "Checked position with beacons. Don't think we drifted a foot in 8 hours." In File S/T-8 we find the trimaran Gold Eagle fifteen miles off the coast of Costa Rica, using an 18-ft. diameter Para-Tech sea anchor to stand off a lee shore in 45-60 knot winds. The owner said: "I was concerned we'd be blown to shore, but over the 5 hour period I took bearings from three shore lights... with no noticeable drift." In File S/C-3 the catamaran Rhayader drifted 12 miles in 66 hours at para-anchor (12-ft. diameter). Without the sea anchor she would have probably drifted at 3 knots, a distance of about 198 miles - over dangerous shoals. That's a reduction of 94 percent in unwanted drift. Commercial fishermen need to stay on top of the fishing grounds. In file S/P-2 the F/V Holly & Michael drifted 15 miles during 24 hours at sea anchor (28-ft. diameter parachute). Without the sea anchor she would probably have drifted about 3-4 knots broadside, a distance of about 72-96 miles, or a reduction of 79-84 percent in drift. In file S/P-4 the F/V Captain Gorman III drifted about 9 miles during 48 hours at para-anchor (24-ft. diameter). Without the sea anchor she too would probably have drifted about 3-4 knots broadside, a distance of about 144-192 miles, or a reduction of 94-95 percent in drift. In file S/P-5 the F/V Ashly G drifted 4-5 miles during 24 hours at para-anchor (24-ft. diameter). Without the sea anchor she would have drifted at 3-4 knots broadside, a distance of about 72-96 miles. A reduction of 94-95 percent in unwanted drift. These numbers tell us that, currents notwithstanding, large parachute sea anchors are like "portable moorings." They are worth their weight in gold when the chips are down and there is a lee shore involved. File S/C-6A is the classic example. The 43-ft. catamaran Ariel was off the Mexican coast. The wind was blowing Force 9 and three rocky islands, Islas Tres Marias, were to her immediate lee. These islands are Mexican prison colonies. Pleasure craft venturing too close have been known to be approached and sometimes rammed by Mexican gun boats. Ariel's owner deployed an 18-ft. diameter Para-Tech sea anchor, which kept her "anchored" for 20 hours. Apprehensive about those islands to leeward, he kept a close eye on the GPS readings. How much did the boat drift in those 20 hours? Only 2 nautical miles! That's 0.1 knots, or about 600 feet per hour - the length of two football fields. This translates into positive control over a wide range of marginal situations. Without her seaborn parachute, the shallow draft, high windage catamaran would have probably drifted broadside at 3-4 knots. Aside from the prospects of having to beat into 15-18' head seas, her remaining option would have been to run. Ariel, with owner, wife and two small children on board, would have had to turn and run off, getting blown all the way back to Cabo San Lucas, whence she departed several days before. I wouldn't say the ride [at sea anchor] was comfortable. It was like a rodeo or a roadstead anchorage with no barrier to the fetch. Boat motion was quite extreme, with gunnel to gunnel roll being set up, then dying down again every few minutes. Jim played out the warp and then the chain, and slowly we swung around into the waves.... The gentle hove-to movement had changed to a jerky sideways rock, but now we were parting the waves with the bow and not taking them every which way. Saturday morning, June 22, suddenly Guy said "We're going backwards." Jim saw the loose chain out of the front hatch and said, "My God I think we've lost the sea anchor...." Jim raced about... "It's OK," said Guy, "it's a much nicer motion now" [the vessel now lying a-hull].... Jim lashed the tiller to one side and we lay a-hull with no sails. The motion was certainly more comfortable.... It was mid-afternoon when we were knocked down. There was no warning. No roar as the rogue wave approached us. It was deceptively quiet.... It seemed like slow motion as I rolled out and hit the table, breaking it off the wall. Then the sound of rushing water. I looked up and saw a waterfall pouring through the gap in the companionway. Where pitch and roll are major concerns, the Pardey method is the antidote, and the transition to peace and quiet can be dramatic. Imagine motoring into the seas on a windy day, the yacht pitching up and down, rolling and bucking. You hoist the sails and turn off the motor. The bow falls off, the sails fill, the yacht heels, and everything quiets down. The transition before and after heaving-to is quite similar. Once the trysail fills and the yacht heels everything quiets down. Everyone who has used the Pardey method will readily confirm that it is the most comfortable way to ride out gales. A reminder once again that the yacht must be properly hove-to, in the manner described by Lin and Larry Pardey in Storm Tactics. Go out on a windy day and practice heaving-to with sails until you can do it in your sleep. Then practice heaving-to with your sails and the sea anchor. Presently there are 93 sea anchor files in the DDDB. Of these, 40 are monohulls, 42 multihulls and 9 commercial fishing vessels and other powerboats. If the boats were all the same, the sea state was always the same and all the deployments were experimentally controlled, one could begin extracting patterns. Unfortunately they are not. Extracting patterns from the behavior of so many different boats in so many different sea states - what the scientist would call "multivariate data" - is difficult. But a skilled statistician would try nevertheless, proceeding cautiously, on the premise that one case history can no more prove a generality than a single swallow can make a summer. While sea state tolerance - the ability of a boat and its crew to survive heavy weather - is a function of many complex things, if we can for one moment plot it as a function of alignment, we may be able to infer patterns from yaw angles. Alignment has an inverse relationship with side to side yaw. The greater the alignment, the smaller the angle of yaw and vice versa. Ordinarily the bow tries to fall off the wind. It can only fall so far before it comes up short against the rode, which tightens up and pulls it back into the wind. Theoretically, the sum of the force of the wind on the yacht can be thought of as being exerted against the CE or center of effort - the imaginary point through which all wind forces tend to act on a boat. The wind force is opposed by the resistance of the hull in the water. Theoretically, the sum of the hull's resistance can be thought of as being exerted against the CLR or center of lateral resistance - the geometric center of everything below the water line. The distance between the CE and the CLR provides the basic yaw lever. The pictures below show two extremes. CE (center of effort) well forward of the CLR (center of lateral resistance) produces a long, positive yaw lever. This vessel will yaw a great deal at anchor CE to the rear of the CLR produces a short, negative yaw lever. This vessel should yaw very little at anchor. If the CE is well forward of the CLR, as with the cat-rigged vessel shown in the upper image, the yaw lever can be said to be positive, resulting in a great deal of side to side yaw at anchor. 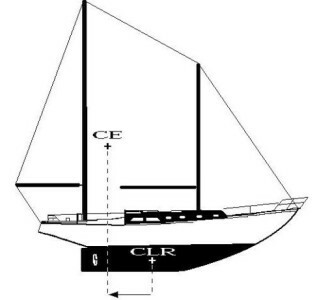 If the CE is well to the rear of the CLR, as with a schooner shown in the lower image, the yaw lever can be said to be negative, resulting in very little side to side yaw at anchor. Most of the monohulls cataloged in this publication have yaw levers that are positive - CE forward of the CLR. Depending on the rig, keel type and position of the CLR, some of the yaw levers are long, some short, resulting in varying degrees of side to side yaw. Logically that's what one is looking at in the tables shown on the next page. These tables aim at encouraging the reader to extract his or her own truths from the DDDB. For reference purposes, note that data is given in the same order as the files themselves. Long 3-mast 40-50 1.8' ??? Full Ketch(M) 65-75 7' 15-20°? LA Fin Sloop 35-45 12' 30°? 20' Sloop 30 12' ?? 24' Cutter 70 18' ?? Let the reader who is a statistician try to extract patterns from these tables. Not an easy task! If we had 1000 files the job would be a lot easier. All the same, we can see some rather obvious patterns relating to classes of vessels. Note, for example, the obvious differences between monohull and multihull yaw angles. The wide beam of a multihull allows the use of a restraining bridle, reducing side to side yaw. One might say that a multihull's beam lever nulls out its yaw lever. Note the greater yaw angles of the multihulls that did not use bridles. One can see the correlation between sea anchor diameter and yaw angle quite clearly among the multihull files as well - find the largest bridled yaw angle and note the diameter of the sea anchor being used. We do not feel para-anchors should always be used with a riding sail or bridle. The riding sail only provides extra comfort for the crew. The parachute anchor [with no bridle] did hold Seraffyn almost directly head to sea. The tacking through the eye of the wind mentioned in our first book was just a nuisance, not a danger. The boat never fell more than 15 or 20 degrees away from the wind, i.e. she never lay even close to beam on, but only swung a few degrees either side of head-to-wind when the parachute anchor was lead directly off the bow, with or without a riding sail.... If there was a lot of wind, the para-anchor held her pretty close to head to wind. (Emphasis added). Once wind moderated the yaw increased, but at the peak of the wind boat held almost dead into wind. There are many unknowns in these tables. For one thing the positions of the CE and the CLR are in reality quite fluid - attitude dependent. 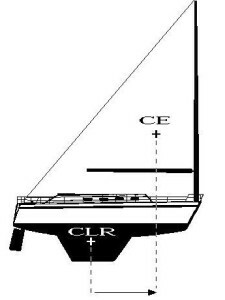 The position of the CLR changes constantly as waves pass under the boat. When the bow is lifting over a crest and the stern is submerged the CLR moves aft. When the bow is immersed in a trough and the stern is out of the water the CLR moves forward. One can infer a relationship between pitch and yaw from this - more pitch equals more yaw - and roll - everything else being equal. This, in turn, would lead to an additional inference about the relationship between hull shape and yaw angle. Victor Shane has long suspected that fore and aft buoyancy has something to do with behavior at anchor - a long box would pitch a great deal more than a bowl. A design that places a great deal of buoyancy fore and aft - some of the modern boats - would be more susceptible to pitch-induced yaw than a design that does not, say one of Bill Garden's classic designs with a narrow bow section and counter astern. Perhaps one can infer something about the value of canoe sterns from all this. There are other unknowns, the most complex of which involves orbital rotation. Going by the generalization, "slack is bad, tension is good," one can see orbital convergence producing slack in the rode, which would then allow the bow to fall off the wind. In 15-ft. seas, for example, the orbital diameter is also 15 feet. If the boat and the sea anchor are out of synch on the wave trains - the boat in a trough and the sea anchor on a crest - they will converge. The boat will move towards the sea anchor 15 feet and the sea anchor will move towards the boat 15 feet. This will, momentarily, produce 30 feet of slack - the bow will fall off and the yacht may briefly come beam-to the seas. Looking at the above tables, one can only wonder as to how much of the yaw angles were produced by orbital rotation, irrespective of rig type, keel type, wind force or sea anchor diameter. File S/M-16, for example, has the authors puzzled. Here we have a 31-ft., full-keeled cutter, Halo, using a 12-ft. diameter Para-Tech sea anchor in 35-40 knots of wind and 14-ft. seas. By all tokens the sea anchor was large enough, and yet the yacht was yawing up to 90° - briefly lying a-hull now and then. Victor Shane asked her owner, Steve Lockwood, the usual questions. Was there something different about this particular Cape George Cutter? The answer was no. Did she have a big, heavy inboard engine, or a great deal of weight situated aft? The answer was no. Did she have a great deal of windage up front - heavy roller furling gear? No, the sails are hanked on. So then why did the boat yaw so much? Shane strongly suspects that there just wasn't enough wind. The sea anchor was deployed on 300' x 1/2" nylon three strand rode along with 50' x 5/16" chain. Perhaps the yacht and the sea anchor were out of synch on the wave trains. Perhaps a little adjustment in rode length might have reduced the yaw angle. We did not observe surge or shock loads on the rode. The boat always seemed to head into the wind and seas at the same angle (<10°) and did not sail about at anchor. The entire system worked perfectly, probably because of a) the length of the rode, b) the catenary induced by the chain in the middle of the rode, and c) the boat and anchor were in crests and troughs in synchrony. Victor Shane suspects some inherent virtue in the Crealock design - the canoe stern, the shape of the keel, the relative positions of the CLR and the CE, etc. Note that the Crealock in the very next file, S/M-18, also behaved very well, even though no chain was used, and her skipper says nothing about synchronizing the boat and the sea anchor on the wave trains. Fancy Free II deployed a 15-ft. diameter Para-Tech on 300' x 1" nylon three strand. Were boat and sea anchor accidentally synchronized in crests and troughs? Is this why she was yawing only 10° off to each side? Unknown. If fifty Crealocks and fifty Cape George Cutters had used identical para-anchors in the Queen's Birthday Storm answers would have been forthcoming. For now we have to make do with probabilities. There are other complications. Much like the wing of an aircraft, the curvature of the hull itself will sometimes produce lift, causing the yacht to sail forward and creating slack in the rode. Add high freeboard at the bow, roller furling, a pilot house, a big cockpit dodger, a radar arch, etc. and the picture becomes complex indeed. Going by generalities and the law of averages, the cause does seem to be rooted in the concept of the yaw lever described above. Thus one should be able to reduce yaw by reducing the yaw lever. How does one reduce the yaw lever? By stepping the mast aft? By making major modifications to the hull, and/or installing daggerboards well forward? Fortunately there are simpler ways. Going by the premise, "slack is bad, tension is good," one could start the engine and place it in slow reverse, for example. This would pull the boat away from the sea anchor, take up slack and reduce side to side yaw. The method really works (try it at regular anchor and see for yourself). It is one option, providing the engine/s are up to the task and the fuel tanks are clean. If the fuel tanks are dirty the agitated motion of the yacht in a storm will place the sediments in suspension and clog up the fuel lines. The most logical way of reducing side to side yaw, however, would be to invest in a good riding sail. Any riding sail flown on the backstay will instantly move the CE closer to the CLR, reducing the yaw lever. In the above table, note the differences between the yaw angles of the ketches that flew mizzens (look for the letter "M" after "Ketch") and those that didn't. In particular note that one catamaran ketch did not use a bridle, but flew a mizzen instead, yawing no more than 20° off to each side. On the surface this would seem to be telling us that riding sails can do for monohulls what bridles are doing for multihulls. Every boat that has ever flown a riding sail astern has been able to improve its behavior at anchor. Can you really carry sail in 70 or 80 knots of wind? Although fear of the unknown has kept many people from trying to set sail in extreme winds, properly built and properly sized storm sails with good leech and foot lines will definitely work in these winds.... We ourselves lay hove-to in 89 knots of wind off Cape Palliser (60 miles east of Wellington), using just our 9-ounce triple-stitched Dacron storm trysail, which is about 33% of our mainsail area. Even with a proper riding sail, wind alignment is a fickle business, especially in large seas when big waves can block the wind in the troughs. A moot point, because when waves are actually breaking a vessel can only be carried so far before she comes up short against the rode, which should positively yank the bow around. I remained below for the better part of three days. I still don't know the strength of the winds as my hand-held indicator wasn't working properly - it was stuck at 60 knots. The boat did tack in this position. In the trough there was little pull on the parachute anchor and the boat would set up to 50° from center. As she neared the crest more tension would be put on the rode, pulling the vessel straight.... With the parachute anchor I never really felt in danger. We deployed the parachute to windward, with no problem, but the line went taut so fast and so tight that we couldn't get the double-lined fire hose chafe gear in place. We tried motoring up on the anchor to relieve pressure - but with 55 knots of wind on the nose, and the parachute in 5 knots of opposing [Gulf Stream] current pulling us INTO the wind and waves, we couldn't get the rode to slacken..... The rode was so taut instantly that we could see the 3-strand 5/8" nylon reducing in diameter. It was stretching down to 1/2" or less.... Meanwhile, as we worried about chafe, the para-anchor was working beautifully. The boat rode up the face of the waves, punching through their tops as the huge seas rolled under us. No more green water came on board, no more near knock-downs. There is an opposing argument. It has validity and it goes something like this: "OK, so the sea anchor will exert a strong, positive pull on the bow if the boat is hit by a breaking wave. But will it do so quickly enough?" In books, in magazines, among opinions expressed on the internet, and in Compuserve's Sailing Forum, this seems to be the main objection to the use of sea anchors in "ultimate" conditions. Some sailors argue that the yacht may get struck, capsized and rolled by a breaking wave, in the second or two that it takes for the sea anchor to exert its influence. One can speculate about all sorts of things. A 50-ft. rogue wave coming in at right angles and breaking down its full face right on top of the boat. "Plunging breakers" and "spilling breakers" so violent, so anomalous, so instantaneous as to throw the yacht end over end in spite of any and all drag devices being used. No doubt there are such phenomena in creation - tsunamis nearing land, stacking waves in the Queen's Birthday storm, to give two examples. Yes, there are times when men can do little or nothing to help themselves. Yes, lightning does strike humans. But what should one do? Take up residence in a granite cave? The circumstances leading to the tragic capsize of the catamaran Bayete in File S/C-19 notwithstanding, the dread pattern has yet to show itself in the pages of the DDDB - the best current evidence. Many of the sailors contributing to this publication may have come close, but the pattern is not there, given the multitude of heavy weather files. For example, one might have expected Prisana II (File S/M-38) to have come to within a hairsbreadth of being "rolled at sea anchor." But it does not appear that this was the case, her owners being quite certain that the sea anchor actually saved the boat. How close did Tortuga Too come to being capsized between Cape Horn and the Falklands? How close did the Pardeys come to being rolled in the Bay of Bengal? Scientists look for patterns in the data. One capsized catamaran does not yield such a pattern, especially in view of the fact that it may have deployed the sea anchor improperly - attaching one arm of the bridle to the middle of the crossbeam instead of to the other bow. The boat handled very well, but it was unnerving to be held to survival by a thin 5/8" line. Sleep was impossible. The sea anchor definitely saved the boat and I'm sure our lives. It operated flawlessly on those 2 days and the other 3 days during the other 2 gales. I suspect that when the rogue wave hit, the chute was collapsed, because the rogue wave hit us pretty much broadside on the port side of the boat. I suspect that at this time we came close to being capsized, and quite possibly the parachute anchor, even though it was collapsed and allowing us to lie broadside to the waves, probably kept us from going over.... Having observed how the boat reacted to the sea conditions when she was being held by the sea anchor, and comparing the actions of the boat without the sea anchor, there is no doubt in my mind that the sea anchor is the ultimate survival tool in heavy weather offshore. First time I deployed the sea anchor was in a Force 10 storm (BBC Radio 4) 120 miles NW of Cape Finisterre (Spain).... I am convinced it saved the catamaran and me.